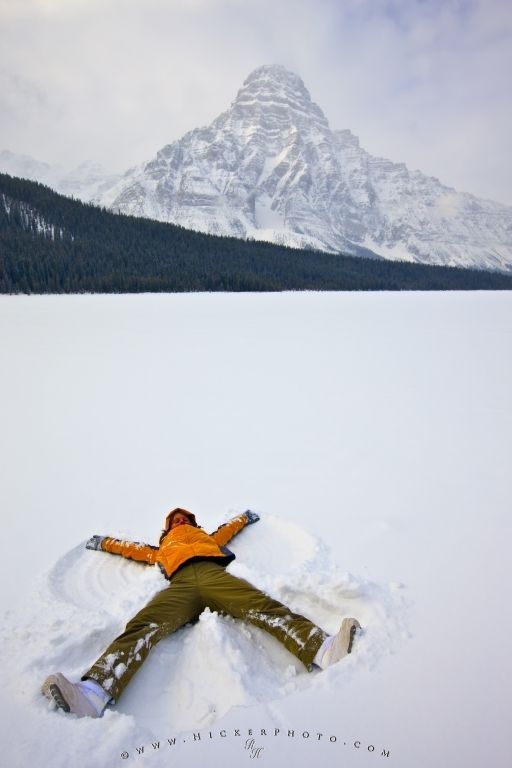 A tourist lies on her back and makes a snow angel after fresh snowfall on Waterfowl Lake during winter. The scenery in the background of this photo is Mount Chepren, located along Icefields Parkway in Banff National Park, Alberta. This tourist is taking full advantage of the fresh snowfall in Banff National Park by making a snow angel in the untouched snow. In winter, Banff National Park is a popular place to enjoy all kinds of winter sports, but it can be a great place to enjoy the scenery and have some fun as well. This snow angel has actually been made on Waterfowl Lake and in the background, the tall imposing presence of Mount Chepren can be seen covered in snow and almost fading in to the sky. Banff National Park is part of the Canadian Rocky Mountain Parks UNESCO World Heritage Site and is located along Icefields Parkway in Alberta. scenery of Banff National Park in the background. ... They are named so due to the popular image of angels at Christmas time, and the use of the angel as a symbol of peace and light. They can be a fun way to express yourself and it is even better when the snow is fresh and no other depression can be seen on the surface. Mount Chepren, named after an Egyptian Pharoah, stands 3307 metres, or 10850 feet above the outstanding scenery of Banff National Park. It is strikingly beautiful standing so tall in the background of this picture and can be seen for miles around in all directions. I photographed this photo with the digital SLR camera model Canon EOS-1Ds Mark III, aperture of f/8.0, exposure time of 1/100 sec. on ISO 100, as always I used a original Canon Lens, the focus lenght for this picture was 22mm.